BitReplica by Auslogics is a freeware data replication tool which supports automatic backups with several levels of customization. Using Auslogics BitReplica uses profiles which are created easily through a step-by-step process using the built-in wizard. 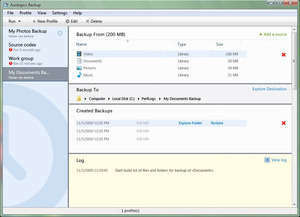 You can backup all sorts of different data types such as digital photographs, school projects, work-related documents and more. With this program, you can perform incremental or differential copies of your files. For security reasons, you should also check out the Auslogics BitReplica download at LO4D.com which includes virus and malware tests. Additional screenshots of this application download may be available, too.